From the inside, The Realistic PRO-38 and PRO-41 and the Uniden Bearcat 50XL are almost identical. They are 10 channel scanners that are very well suited to equip them with a discriminator output. 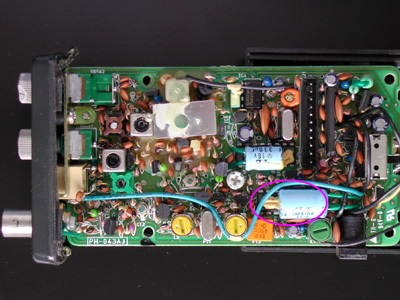 The discriminator IC, a Motorola MC3359, is hidden below a large electrolytical capacitor. If you bend this capacitor upright, the MC3359 can be reached. The unfiltered baseband signal can be found at pin 10. A 10 k is connected to pin 10 of the receiver IC. The other lead of the resistor is connected to a piece of insulated wire. 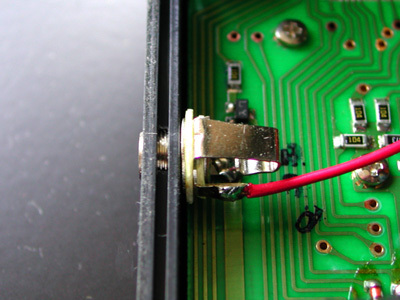 After this, the electrolytical capacitor can be bent back to its original position. A 3.5 mm chassis terminal is mounted in the side of the front half of the scanner. The broad PCB track which is visible on the picture is connected to ground. After removing some of the protective cover, the ground lug of the chassis terminal is soldered to this track. 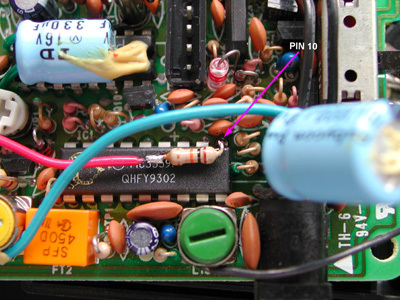 The other lug is connected to the wire running from the 10 k resistor. Because the side of the scanner is quite thick, the chassis part can't be fixed on the outside. For some extra support, the terminal can be glued to the inside of the scanner with a glue gun. After this modification, I had to reset the scanners. Pressing 2, 9 and Manual while turning the scanner on does the trick.